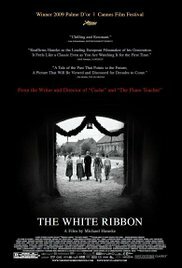 Neighbourhood Cinema movie night at CICCIC with ‘The White Ribbon” 7.00pm. The highly acclaimed director Michael Haneke brings us a dark tale of intrigue and has all the trademarks of his film making, people detached from society, no background soundtrack, film cuts to black between scenes and motivated by the need for the film to ask more questions than it answers. A slightly uncomfortable watch perhaps but a hugely rewarding film. From July, 1913 to the outbreak of World War I, a series of incidents take place in a German village. A horse trips on a wire and throws the rider; a woman falls to her death through rotted planks; the local baron’s son is hung upside down in a mill; parents slap and bully their children; a man is cruel to his long-suffering lover; another sexually abuses his daughter. People disappear. A callow teacher, who courts a nanny in the baron’s household, narrates the story and tries to investigate the connections among these accidents and crimes. What is foreshadowed? Are the children holy innocents? God may be in His heaven, but all is not right with the world; the center cannot hold. Seating at CICCIC: We have sofas, arm chairs and normal chairs. Soon you will be able to reserve a seat but at this time seating is provided on a first come, first serve basis. If you love going to the movies but adore a homely atmosphere, perhaps even a beer or glass of wine then Creative Innovation Centre’s Community Cinema programme will bring a fresh new approach to local movie watching. Registered as a community cinema in Paul Street, Taunton, the independent flexibility of screening films for audience numbers of up to 60 means an intimate setting for a great movie night out. CICCIC is a registered Neighbourhood Cinema with the British Film Institute No. 000921 and a member of Cinema for All.